When you first start a low-carb diet, you may feel confused with which low-carb flours to use. You may never have used any of them before and how to use them properly can be daunting. 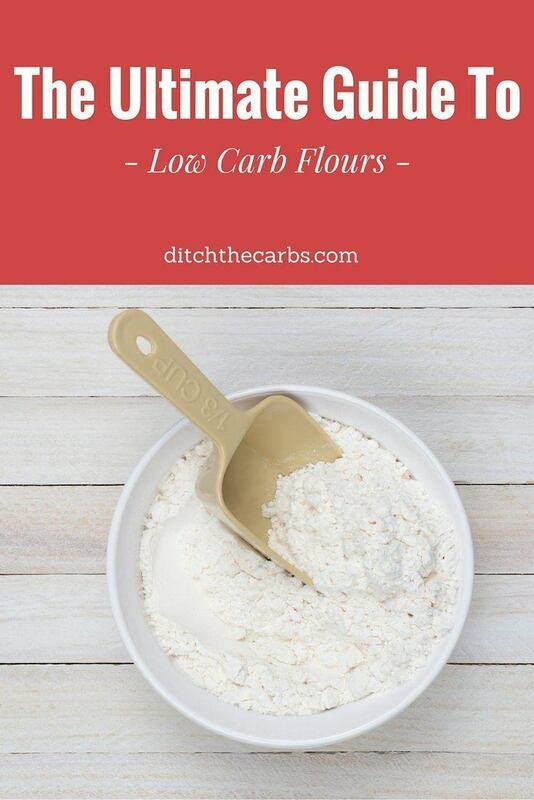 Low-carb flours don’t behave like wheat flour, and how to use them in your old regular high-carb recipes is one of the most common questions I hear. My advice is to begin baking recipes that have already been developed using low carb flours. Most low carb flours cannot be directly substituted in your old recipes. For example, coconut flour absorbs more liquid than any other low carb flour so generally, it is used in small amounts (1/3 – 1/4 of wheat flour) and many more eggs are required. 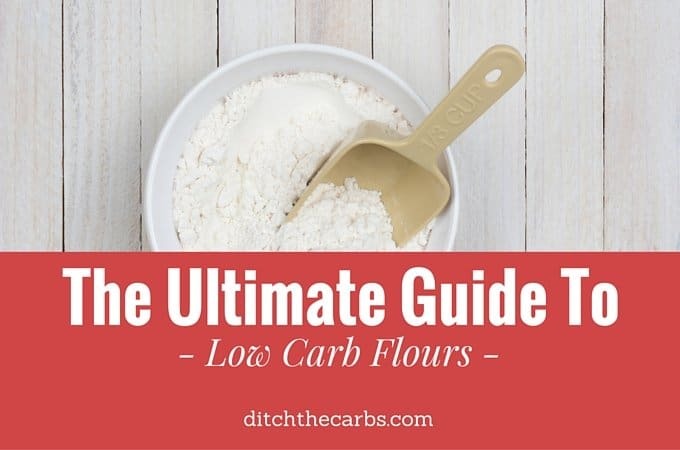 Once you have been low-carb for a while, and really understand how to use low carb flours, you may wish to start experimenting with your old recipes using low carb flours instead, I instinctively know which recipes can be converted into a low carb one, and which ones cannot. So why would you want to bake low-carb food when you can just buy them instead? Because many low-carb Products have been found to contain ingredients that are actually high-carb in disguise, highly processed and may contain wheat, gluten, and corn. Those types of low-carb Franken foods will still spike your insulin typically higher than a snickers bar, despite the fact the products are sold as being low carb. By making your own low-carb baked goods, you can control exactly what goes in (and what doesn’t). These are my favourite low-carb flour options you can buy to help you create your own bread and low-carb baked goods. 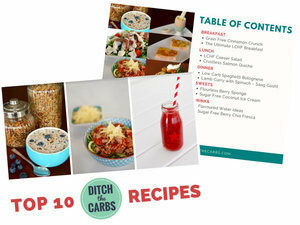 You don’t need to be deprived of your favourite high carb foods while eating low carb. Almond flour is probably one of the most popular low carb flour on the list. The almonds are finely ground and blanched to remove the skins. The flour is rich in vitamins and minerals and provides the most calcium compared to any other nut. A serving (1/4 cup or 28 grams) of almond flour has around 160 calories, 6 grams of carbs and 3 grams of fibre. Making this only 6 total carbs or 3 net carbs per serving. Almond flour is available in supermarkets and grocery stores or can be ordered online. It can be cheaper to buy online especially when you order in bulk. Almond meal may also be known as ground almonds. I have been known to grind almonds using my blender to make my own almond meal, the power of your blender will dictate how fine your almond meal will become. A serving (1/4 cup or 28 grams) of almond meal has the same nutrition of almond flour of nearly 160 calories, 6 grams of carbs and 3 grams of fibre. Only 6 total carbs or 3 net carbs per serving. I do the same thing with almond flour and store the almond meal in the fridge or freezer after opening. Coconut Flour has become popular these past few years and with good reason. Coconut flour is low in carbs, extremely high in fibre and protein. If you’ve been struggling to find ways to increase your fibre, then this is one low carb flour that can help you out. The biggest difference between coconut flour and most low carb flours is that it does tend to need a lot more moisture when baking. It’s fairly common to find coconut flour recipes include 2-3 eggs per ¼ cup. If you’re new to baking with coconut flour, then I recommend not foregoing the eggs, butter or extra moisture you see in recipes. Top Tip: Coconut flour absorbs a lot of liquid and recipes tend to thicken over a few minutes. If you are making a recipe such as low carb waffles, allow the batter to stand and thicken while the waffle machine is heating up. It will make for a sturdier waffle. Coconut flour has nearly 45 calories per serving (a serving is 2 tbsp or 18 grams), 11 grams of total carbs, 8 grams of fibre and 4 grams of protein. This makes this flour only 2 net carbs per serving. Since coconut flour takes can absorb moisture, it’s important to keep coconut flour in an airtight sealed bag or container. I store mine in a cool, dark pantry and I don’t normally store it in the fridge. Flax meal is also known as ground flax, ground flaxseeds or linseed. Flaxseeds are very nutritious and are a good source of vitamin B1, Copper and Omega 3. What’s great about baking with flax meal is that not only can it replace flour in recipes, but it can also replace eggs in recipes. To replace 1 egg, mix 1 tbsp ground flax meal with 3 tbsp of water and allow it to swell. This can be used to replace the eggs but it will not give to properties that eggs do. Eggs help bind the ingredients, eggs help the baking become light, fluffy and rise. Eggs help emulsify the mixture. This formula is used in many vegan recipes or those who are allergic to eggs. If a recipe is heavily based on eggs, this substitution will not work. Ground flax has nearly 70 calories per serving (2 tbsp or 14 grams), 5 grams of total carbs, 4 grams of fibre and 3 grams of protein. This makes flax meal flour only 1 net carb per serving, and one of the best low-carb flours in terms of net carbs. Flax meal and seeds can become rancid very quickly, so it’s always good to store the flax in the fridge before and after opening. Most bags do come in an airtight bag. If not, you can use an airtight mason jar for storage. You can even freeze portions. Sunflower seed meal and pumpkin seed meal are good options for those who are allergic to almond flour or coconut flour. They are high in vitamins and minerals such as vitamin E, copper, thiamine, selenium, and phosphorus. They generally can be used 1:1 in place of almond flour/meal. The downside of these is that they can be a bit more expensive than most low carb flours and hard to find. But, you can make your own sunflower or pumpkin seed meals using a sturdy food processor or coffee grinder. Sunflower seed meal can be stored in a cool dark pantry and seems to last up to 4 months outside of the fridge. Although psyllium husk is not flour, it is a great addition to any low carb pantry. Psyllium husk is all fibre and is used as a colon cleanser. In baking, it can to add volume and thickener to help the recipes bind together. This leaves a recipe with a great crumb-like texture. Most brands come in a bottle and can be stored in a cool pantry. Great information and will be very useful moving forward in a low carb diet; but why has the art of proof reading been lost lately. Should have had a proof reader go over your context , as there were many grammatical errors. Hey, thanks for offering for the help with proofreading (only kidding) 😉 FYI I am on NZ so much of my spelling is NZ/UK, the world is a wonderful and varied place and we don’t all spell the same. 🙂 I’m trying my best. I would have liked to see a discussion of oat fiber. I am disenchanted with psyllium husks and other options for ‘fiber fillers’, but the flavor and profile of oat fiber has served me much better. If you could provide more information about its use (when to use it, when NOT to use it, its properties …) I’d love to have the benefit of that from someone speaking from a position of knowledge. Thanks for all the help you give to us. I greatly appreciate it. Can you tell me how to substitute almond or coconut flour to cassava flour? I have a couple of recipes with cassava flour and prefer the others for low carb options. Gosh it’s hard to comment without seeing the batter and the baked cookies. If they were crumbly, I would add an extra egg, if they were dry, I would add extra butter. HI can you please tell me the, total carbs or net carbs per serving for sunflower seeds and pumpkin seeds. Thanks. This chart is my Ultimate Guide To Carbs In Nuts And Seeds. It’s so handy to see them all there. What is the ratio for replacing almond flour with flaxseed flour please. I’m definitely going to try the sunflower and pumpkin seed flours. My boy is allergic to nuts and eggs so I can’t use some coconut flour recipes because of the eggs. I’m afraid there won’t be a straight substitution ratio because they behave a little differently. Not as different as coconut flour vs almond flour, but flaxseed nonetheless will have a different protein/fat/water ratio so will act in cakes and baking in a unique way. Saying that I love experimenting. I would begin by using a lower amount of the flaxseed to whichever recipe you decide to try, then mix and see what the result is. It may be that you need some extra liquid, an extra egg or a little more flaxseed. Sorry, that’s probably not the easy answer, but in the long run, if you get to really know how these new flours world – bam – you’re away! Just found your website! What an incredible help it is for me. I just converted to a low carb diet a couple of weeks ago, and must admit began struggling with some of the foods we love as a family and didn’t want to give up. Plus the information about almond flour increasing inflammation was eye opening. I have both rheumatoid and osteo – arthrits and recently it has really acted up. Now I know why. I will use coconut four more now! Thank you. I am so glad this has helped you discover what has happened, and why. I love using coconut flour in my recipes. it’s so much healthier and cheaper! And the omega 3:6 ratio is preferable for a reduction in inflammation. Hi, Libby. I’m confused now, because I’ve read that almonds help to FIGHT inflammation. Please tell me it isn’t so that it INCREASES inflammation instead? Yes, nuts can be seen as antiinflammatory when eaten whole and in small amounts, the problem with much of low-carb baking is the huge quantity of almonds you can easily consume in just one slice of cake/pie/cookie. 1 cup almond flour = 90 almonds, and I don’t think many would sit and consume 90 almonds, but it’s easy to overeat almond baking so I am developing recipes with either almond flour or coconut flour to mix things up. This is a great article explaining why we can enjoy nuts, but be cautious of which type and how much. Nuts have become readily accessible too often and eaten it too larger quantities. Nibbling on a few isn’t going to be a problem and probably beneficial. My downfalls are pasta, brownies, etc.. so will probably start with those types of things. I also have an airfryer so I’d love to find recipes that can be used in there (if possible as well). I found this article very helpful though. I’ve been using Hodgson Mill soy flour for years, and I’m absolutely heart-broken they stopped making it. I wish I knew why! It was low in carbs and the flavor & consistency differences between the Hodgson Mill and regular flour were negligible. I’ve tried Bob’s soy flour, and it’s not even in the same ballpark with a salty, metallic taste. And the consistency is a super fine, chunky powder that clumps. I’ve read a lot about almond flour as an alternative, and Hodgson Mill does make it. But here’s the rub: I don’t like almonds. Does the flour carry the same strong flavor? I know that may sound like a silly question, but without my Hodgson Mill soy, I’m getting desperate! Is tapioca flour considered low carb? From this label, it appears to be 26% pure starch and no fibre. Personally, I don’t use tapioca flour. is there a substitution for Tapioca Flour? I have a Recipe I’d like to try and it calls for 1/4 cup But I won’t use it. And have done research for Substitution and it led me to this comment I use Xantham Gum for thickening. Any help would be greatly appreciated! Please and Thank you! Hi Melanie, I’m afraid I have never used tapioca flour so can’t comment on a possible conversion. I have however used xantham gum, it is a tricky beast to work with as it can turn gelatinous and lumpy if not added slowly and mixed/blended well. Hence me not developing any recipes using xanthan gum yet. Hello. I want to know if chickpea flour is good for a low carb diet. My vegetarian cousin swears by it. No. Chick pea flour is high in carbs. Stay away from bean flours. A serving (1/4 cup or 28 grams) of almond flour has around 160 calories, …..
maybe you meant 160 kilocalories ? My daughter is allergic to tree nuts, coconut flour as you know doesn’t seem to work as well. Anything else you would suggest? Hi Kathy, I would persevere with coconut flour. Many people say it doesn’t work like regular flour, and while that may be true, I have learned to work with it. I ensure I use enough eggs, enough sweetener and flavours or enough salt and spices to overpower the subtle coconut flour taste. I have a whole new category in my recipe finder just for coconut flour recipes. Wy not give may flourless berry sponge a try to begin with, I love it and my kids make it all the time, even as cupcakes too. Hi. I’m confused about the “Recipe finder just for coconut flour recipes” link. I selected several recipes and they listed almond flour rather than coconut flour. Am I missing it? I’m trying to make empanadas, so was looking for the dough recipe. Hi Libby, do you have an article that addresses texture and leavening agents when using coconut and almond flour? In trying to decrease carbs I have tried a few recipes for baked goods but they’re a bit “off”. One was a brownie recipe using coconut flour, avocados & sweet potatoes. It tasted pretty good but the texture was almost custard like. Would have allowing it to rest & thicken before baking have helped? I wondered about using psyllium husk to thicken or make it more dense. Maybe 3 instead of 4 eggs?? The other recipe was a traditional scone recipe that I adjusted. I used half wheat flour and almond flour. They tasted fantastic but were just a bit too moist and didnt rise as typical which I expected from the reading I did beforehand. Do you have advise on leavening agents? I found “use a little bit more” in a recipe where almond flour is substituted but there was no percentage or specifics on how much “a little bit more” meant… My brain is swirling in trouble-shooting overload! Hi Cathy, are you adapting these recipes yourself or are they already developed using coconut flour? From experience, it takes a lot of attempts to get it right (but fun too, it brings out the scientist in me). Coconut flour requires a high number of eggs for volume, thickening, protein, binding, and structure. I would be worried if there was too much avocado in there as that is just adding a soft ingredient that gives no structure. The sweet potato would add volume but unless there is enough eggs and coconut flour in the recipe, again it won’t add to the solidity of the final recipe. Psyllium I add purely to get a better crumb texture. It swells and thickens and helps bind all the other ingredients together nicely. Scones – they won’t have risen because of the lack of gluten (yay), but I quite like heavy scones as a personal choice. I started baking using recipes that had already been developed using these low-carb flours, and start by adjusting the flavours only not the ratios of the bulk ingredients. You will soon get the hang of them. Start with my flourless berry sponge, I use these ratios all-the-time! Yum. Used erythritol here as well. Both turned out really good! In my previous comment about brownies, I forgot to mention that for option no.1, oven time for mine was 28 minutes. Libby, do you have a conversion for substituting defatted peanut flour for almond or coconut flour? I got a great deal on some and need to use it (it’s close to expiration date). Even if I could only use it in combination with one of the other flours, that would still be great. Thanks, Libby, for your labor of sacrificial love! I’m afraid I don’t. I have never used peanut flour and would hate to guess a conversion for you. And as you may know, almond flour and coconut flour are completely different beasts so are used completely differently to one another. If you are about to throw it away anyway, maybe try experimenting with it, you have nothing to lose (other than some eggs and butter perhaps). This recipe for spaghetti Bolognese with zoodles is my family favourite. 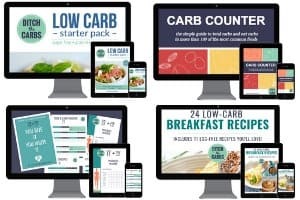 It was one of the first I developed when we went low carb as a family. 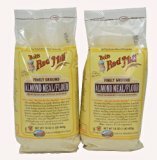 Does almond flour go off even if its kept in an airtight container (but not in a fridge or freezer)? I have some almond flour that I’ve had in an airtight container for years (from the last time I tried low-carb baking), and it seems fine. It doesn’t smell off and it looks good. Should I just assume it’s off and dump it? I wouldn’t like to use it if it is years old. I tend to buy a packet at a time so it is only a few months old each time. I would worry about the fats in the almond flour after a year. Beginner question: which type of flour would you say is most similar to typical white flour? Maybe a silly question, but hey, gotta start somewhere! I guess the closest would be almond flour/ground almonds but there is not a direct substitution because wheat flour behave totally differently because it has gluten. Great question to ask and I am so glad you are starting low carb. Begin by baking an established low carb recipe first. All the hard recipe development has been done for you. Enjoy, and welcome. Hi Libby I cannot use coconut flour as my fiancé has an intolerance to coconut. Can you recommend anything I could use instead? There are many recipes here that use coconut flour OR almond flour. Some I even have instructions to use both (from the post above, you can see they are not easily interchangeable). Is he tolerant of almond flour? I have many recipes which use that. Some recipes that use a small quantity of almond flour/meal, you can actually use some seed flours such as sunflower or pumpkin. I managed to make Fat Head pizza once using ground sunflower seeds when I ran out of almond flour. Thank you for the reply, yes he can tolerate almond flour/meal. I look forward to trying your recipes. I found this recipe for Brazilian cheese bread; it uses tapioca flour. Any ideas on a substitution? Please and thank you. I’ll add the link to the recipe. 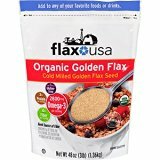 If using ground flax meal in place of coconut/almond flour in a recipe is it 1:1? I’m afraid there is no simple substitution rule for almond flour:coconut flour: flax meal. What about soy flour? I’m not a big fan of soy-anything, but I have a few recipes that call for soy flour. Can I sub coconut flour for it? I’m afraid I have never cooked with soy flour spoon can’t advise. By chance anyone know of a low carb alternative for a batter for English fried fish? I tend to just ‘crumb’ them in ground almonds, salt and parsley or lemon. Works a treat. This is the recipe. To Beverley: Apparently chia seeds create a great, crunchy coating for fish. I think that what Beverly is talking about when she says English battered fish is one where it isn’t crunch, exactly. The fish is dipped in a flour and egg based thick batter and deep-fried, leaving a lovely chewy coating on the outside. So delish! The closest thing I can think of in US terms are those batter dipped hot-dogs on a stick people used to eat. Anyway, I suspect we’d be moving more in the direction of some substitute using beaten egg whites, perhaps? Maybe modifying something more in the line of keto pancake batter? I have a recipe that calls for Cassava flour – can I sub Almond Flour 1:1 on that? No sorry, cassava flour is more absorbent than almond flour. If you want a really decadent pastry recipe, use fathead pizza. It is so versatile. Alternatively you can use the base of the spinach and feta pie. I have been on a keto diet since Jan’16. I have kept away from the flours so far, but eventually I will have to start experimenting so I don’t get bored with eating the same food stuffs. I have been wary of flours, just in case making low carb bread would tempt me back into normal bread. However as treats I think it could be a good idea…. especially the fathead pizza for example. My most basic white sauce I make is to deglaze the pan with full fat cream cheese then whisk in heavy/double cream. It works like a charm. What about ground chia flour? I use that a lot and it binds really well. Yes ground chia is great. I tend to use it in smoothies or add to my granola recipes.